Thank you for coming to our school and teaching us about weather. Some day when I become supreme Ultra-Lord of the universe I will not make you a slave, you will live in my 200 story castle where unicorn servants will feed you doughnuts off their horns. I will personally make you a throne that is half platnum and half solid gold and jewel encrested. Thank you again for teaching us about meteoroligy, you’re more awesome than a monkey wearing a tuxedo made out bacon riding a cyborg unicorn with a lightsaber for the horn on the tip of a space shuttle closing in on Mars while ingulfed in flames … And in case you didn’t know, that’s pretty dang sweet. Now that’s what I call a thank-you note. This kid has not only the imagination but also a gift for concrete imagery that every great writer needs. Flint may have a future in writing. Yesterday, I received an unforgettable thank you gift from the mother of some students. For the past seven years, I’ve run an informal middle school literature group in my home for six to ten local homeschoolers, including my own daughters. We read good books and talk about them in between meandering tangents, corny jokes and general silliness. Yesterday was the last meeting of the year, and probably the last one ever, since my youngest daughter will be too old for the group next year. I’m going to miss that gang. Heather Hughes, a dear friend and mother of two of the girls in the class, has an amazing gift for cake decorating. She baked the masterpiece pictured here along with a note plagiarized from Flint. 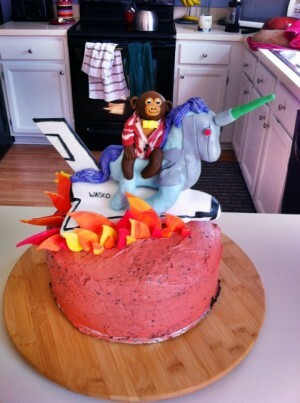 Notice that all the elements are there: bacon tuxedo on the monkey, light saber on the cyborg-unicorn, flame-engulfed space shuttle (with my name on it). Even the cake itself is red to look like Mars. I have never been honored more creatively. And, I must say that the cake was delicious too. Thanks, Heather! See the news item here or the video below for more on the original note. Help us grow our readership! Share our posts on Facebook, Twitter, Pinterest or Stumble Upon! Thank YOU, Brian! You are pretty dang sweet! That was super stupendous. Thanks for sharing! It was a piece of cake, Cheryl! Thanks Brian for teaching Isaac and Hannah. You are a blessing! Thanks for letting me. I love those kids.